Changes in lifestyles, nutrition and racial and / or ethnic composition of populations lead to changes in the distribution of body dimensions (eg obesity) and with them comes the need to constantly update based on our anthropometric data. It is considered to anthropometry as the science that studies the human body measurements in order to establish differences between individuals, groups, races and differences between different times in ourselves. Obesity is defined as an increase in body weight due to fat. To quantify the excess fat and thus measure obesity, they have adopted anthropometric measurements or indirect methods of assessment of adipose tissue. 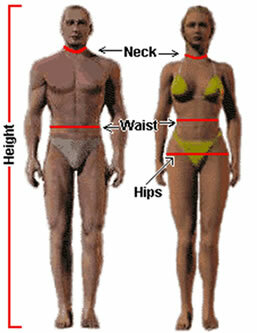 Anthropometric measurements refer to measurements made in different parts of the body. They include those to determine indirectly the amount of total fat, which are designed to classify individuals according to their weight (body mass index measurement and folds among others), as well as measures leading to the determination of the distribution of fat in the different compartments of the body (such as the triceps skinfold, arm circumference, wrist, waist and hip). With the results of these measures can be assessed nutritional status, identify and therefore prevent excess weight due to fat and no muscle. Skinfold to measure the depletion or excess fat deposits. They can be taken in different locations, although the most used are the triceps, abdominal, iliac, shoulder and quadriceps fold. 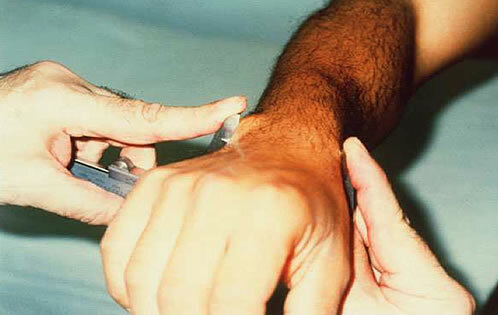 The triceps skinfold is taken in the back of the arm, at the level of the midpoint between the olecranon and the acromion. The child / to extend the arm and leave relaxed is requested. We take the skin fold and to ensure that only fat tissue has taken the skin gently moves while with the other hand move the forearm slightly. 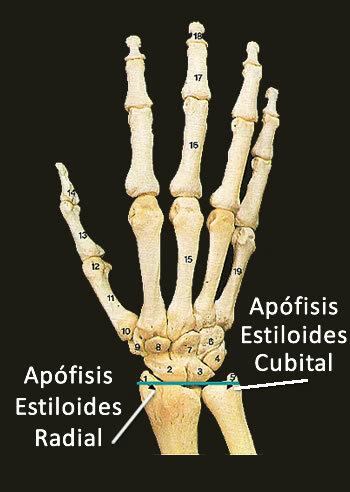 We place the lipocaliber perpendicular to the fold as approximately one centimeter below where we placed the fingers holding the skinfold. The suprailiac is taken in the abdomen, above the anterior superior iliac spine. also follows an oblique direction on the side of the abdomen. It is situated on the line of intersection of a line parallel to the ground at the navel, and a vertical line through the anterior superior iliac spine. The measurement technique is identical to that described for other folds. The abdominal crease is caught two Navel cm vertically. The fold is applied to the apex of the lower angle of the scapula, a cm of it. 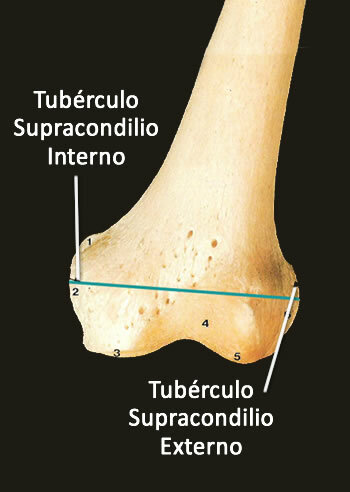 The quadriceps applies fold in the midline between the anterior superior iliac spine and the patella vertically. Leg must be relaxed at the time of measurement. 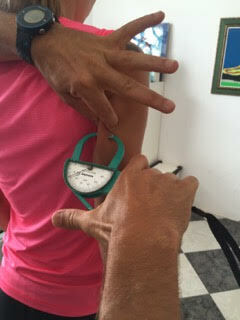 To measure the perimeters tape measure around the anatomical part to be measured is placed. Always before we take enough tape to avoid having to stretch it once placed, movement that could move the site that has been placed. areful to follow the increasing order of the metric scale measure to make reading correctly !! Take with one hand the free end of the tape and with the other hand the piece roller. Untwisted place, well attached to the anatomical portion but loosely. It is placed perpendicular to the part to be measured sense. reading at the point where the two ends of the tape measure cross is made. Careful not to let your fingers under the tape !! 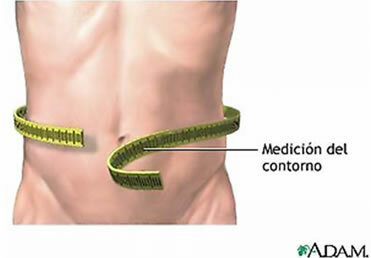 Waist circumference: Measure the height of the navel. To perform this measurement the observer is placed on one side of the person to be measured. The tape is positioned parallel to the ground plane, uncompressed. It is measured at the height of the point of maximum circumference over the buttocks. In this case the observer will also be placed on one side of the person to be measured. The tape is also placed in a plane parallel to the ground, noting that not bent or twisted at any point on the circumference.